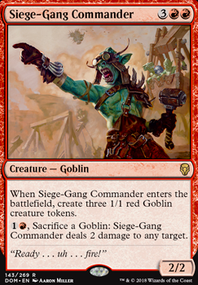 Instead of Goblin Gathering , maybe replace it with Hordeling Outburst ? You're specifically wanting those 1 powers, so maybe things like Warren Instigator , Goblin Instigator , or Squee, Goblin Nabob ? I would maybe put Goblin Gathering back in main. L0TTO both cards could pretty easily fit here, I have Light Up the Stage for draw which wasn’t in the initial list and I cut some of the 4 drops to try and play more aggressively, theater would work better for a more grindy version (which the afterlife cards help with), although spectacle could be harder to enable if you slow down too much. Legion's Landing Flip is super strong in decks like this but I’m not sure what to cut at the moment, maybe the Goblin Instigator s. I’m glad you’re having fun with it! Hi, I think cards like Dragon Fodder or Goblin Instigator are really good in this deck. These type of cards put creatures into play early which will help you ramp with Radha. 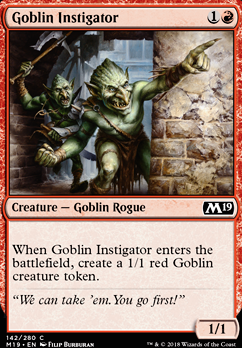 As far as what to remove from the existing build, I am wondering if it may be time to pull some of the goblins, probably the Goblin Instigator . Two mana gets you two creatures. 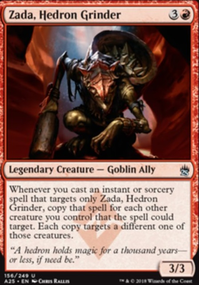 If you swapped in Reassembling Skeleton , you could get one creature for two mana that, unless you opponent has some way to exile, stays around forever. I have played games on Arena where I've sacked the same skeleton three times in the same turn to get my harpy big enough to take out an angel or other big flier. 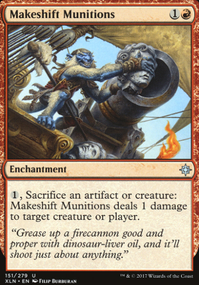 The Goblin Motivator s could be replaced with the Smelt-Ward Ignus to give you more creature control. Lose the Severed Strands in favor of Bedevil , an obvious swap I think. Finally, I hate to say it but it might be time to lose Angrath. When I have played him, I usually have had to use the -3 ability as soon as he was cast. Otherwise, he is gone before my next turn comes or is dinked so consistently that I can never build enough loyalty counterd to blow off the the final -8 ability. People really don't like the +1 so they tend to throw things at him until he is eliminated (which, I guess, could be a good thing). You could replace him maybe with Judith and/or the Haunt. multimedia Thanks for the suggestions! Fireblade Artist is indeed a fine card. I wasn't really thinking about being aggressive with this deck, but it might be good against control match ups. 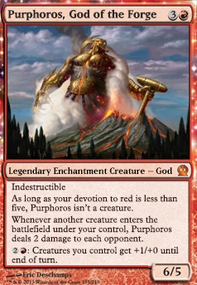 It can swap with a couple of Priests or Enforcers if I need to be more aggressive, so I might consider it as a sideboard piece right now. 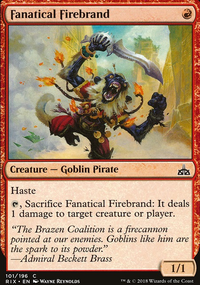 I also thought about using Goblin Instigator , but I think Orzhov Enforcer is the better card when trying to out value the opponent. 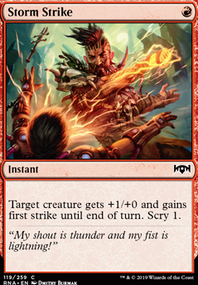 I really value the deathtouch and the death trigger, which really becomes annoying against creature decks. 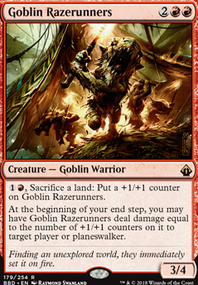 I also don't think I need to invest in the Goblin theme as much, since it doesn't really put me in a better position if I do. But you're right about it enabling Priest more easily that I might try to reconsider.